The weather at the Open Championship is about as predictable as the stock market–warm and sunny one minute, cold, rainy and windy the next. 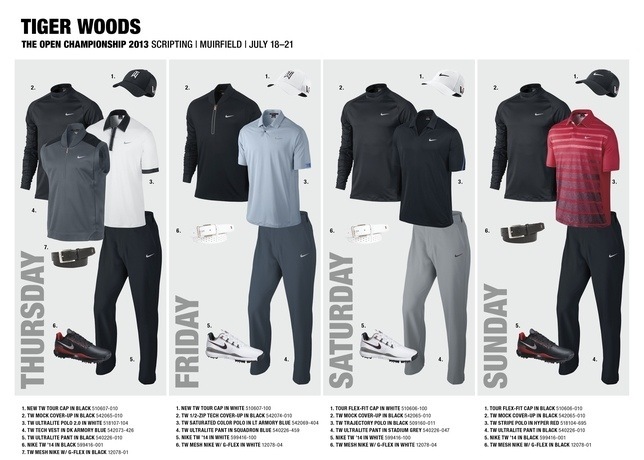 Nike Golf is embracing the quirks of Mother Nature and taking the opportunity to showcase the freshest designs from its Fall 2013 Collections at Muirfield. The brand’s 13 athletes will be outfitted in the latest technologically advanced apparel in order to combat the unstable elements. I’m eager to get another look at the new Nike Hyperadapt Storm-FIT jacket at the Open Championship. I first spotted it on Paul Casey and Rory McIlroy at the Irish Open a couple weeks ago and couldn’t resist tweeting and instagramming about it. 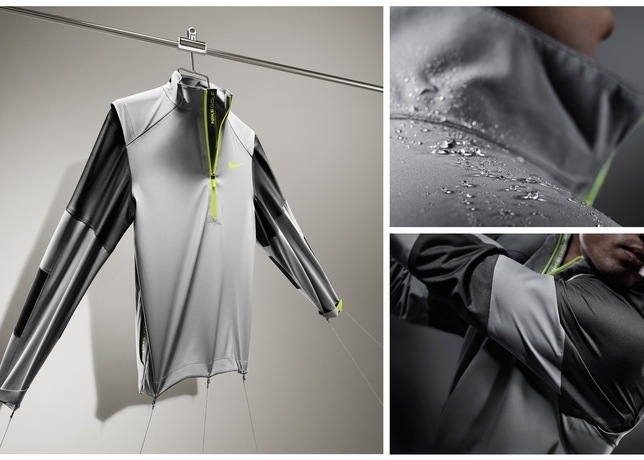 Nike claims that the Hyperadapt Storm-FIT jacket has an “impenetrable outer layer” while maintaining a “sweater-like stretch”–a strong mix of performance and functionality. I just like how the neon accents add some much-needed color and personality to typically drab rain gear. Look for many of the Nike athletes to wear the Hyperadapt Storm-FIT jacket if conditions make a turn for the worse. 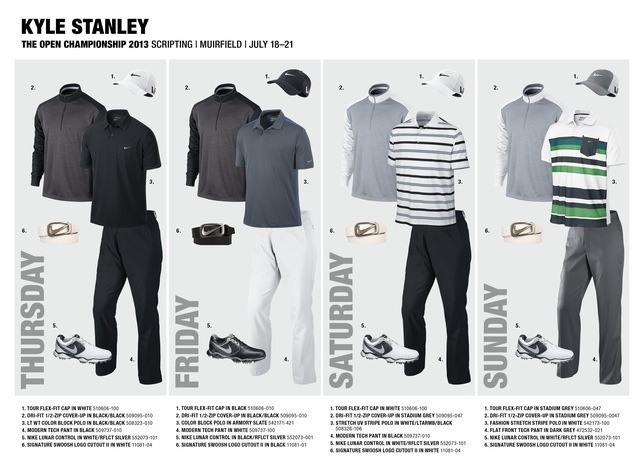 Here are the 13 Nike apparel scripts for the Open Championship with a few critiques along the way. 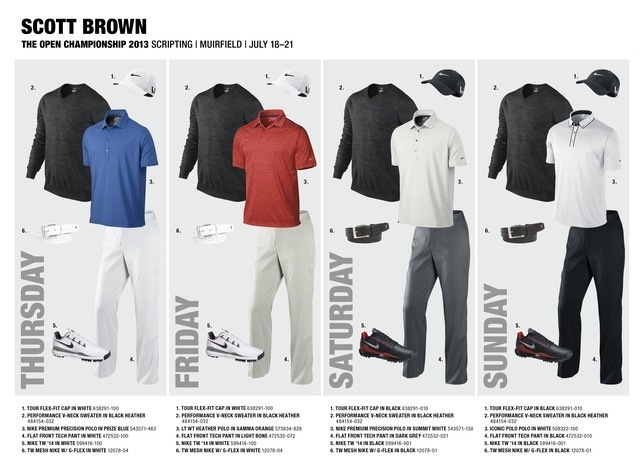 This may be the best apparel script I’ve seen from Tiger. Thursday’s look is one I’d like to see more often from him. The white shirt with contrasting black placket, collar and sleeve hems offers an iconic, Arnold Palmer-esque look. Thursday’s script also calls for one of my favorite pieces from the Nike collections, the Half-Zip Cover Up Vest in a traditional grey/black colorway. While Sunday’s look is very predictable, the wide stripes on the front of the shirt provide a little different look than what we’ve seen lately from Tiger in final rounds. 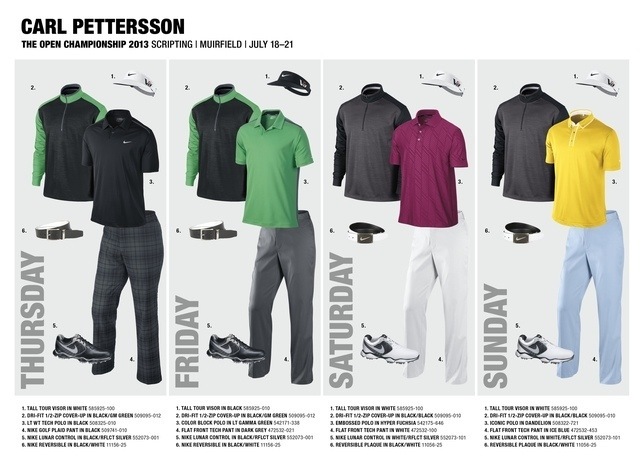 All the shirts Tiger will don at Muirfield are from his Tiger Woods Collection and include many of the high-tech features we saw in his U.S. Open script–ultra lightweight fabrics, laser-perforated collars and a posture-performance chassis with a kimono-style back (whatever that this) for increased range of motion. 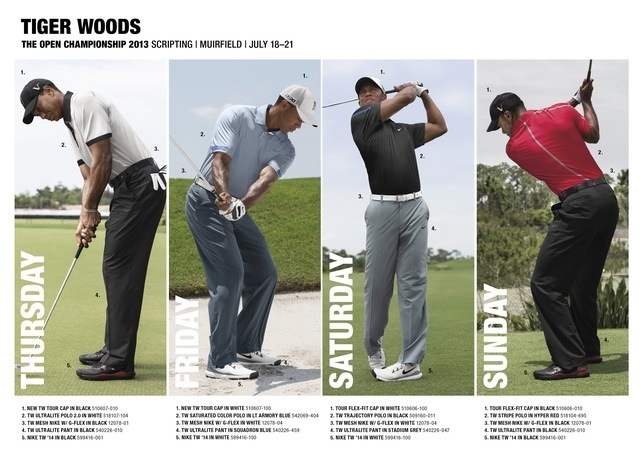 Tiger will complete his look everyday with the new Free-inspired TW’14 shoes. 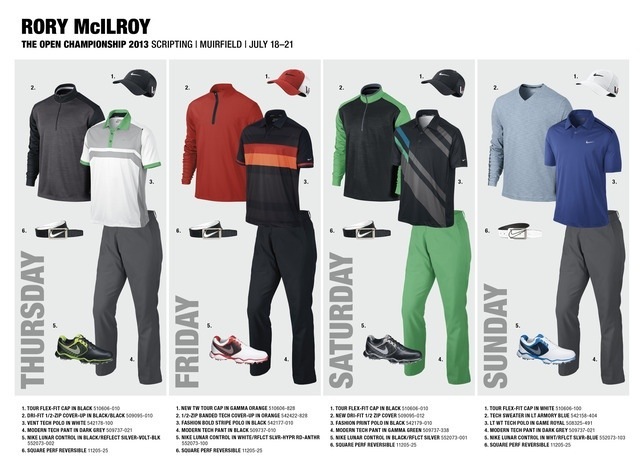 Rory McIlroy will look to recapture his swagger at Muirfield while sporting pieces from Nike Golf’s Fall 2013 Tour Performance collection. He’ll complete his look everyday with Nike Lunar Control kicks in coordinating colorways. 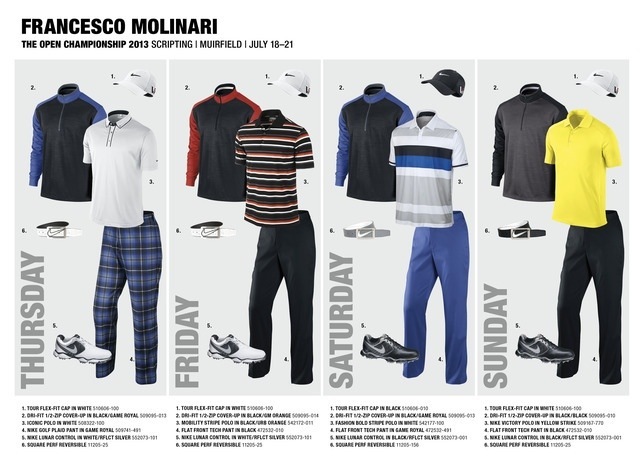 Look for McIlroy to debut new colors and styles from Nike Golf at the Open Championship. The energetic gamma orange and gamma green will be prominently featured in his styling over the first three days. These are fresh colors for Fall and prove that fall colors can go beyond the traditional grey, black and blue. The eye-catching Fashion Bold Stripe Polo with wide, two-tone orange stripes makes Friday’s look the clear favorite. The 2011 Master Champion has made a habit of appearing on leaderboards at major championships. 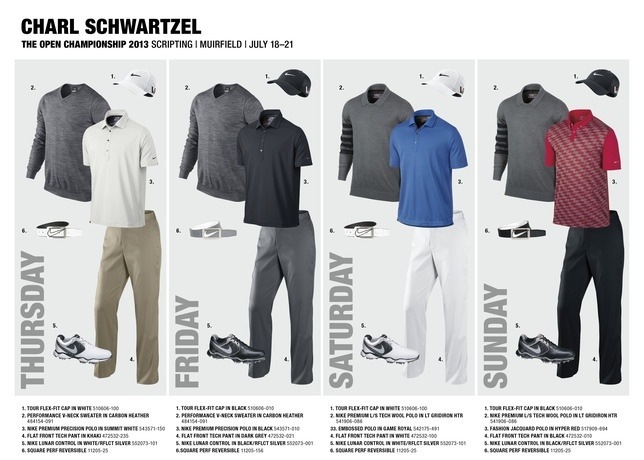 Schwartzel favors a very traditional look on the links as evidenced by the basic shirts, pants and sweaters in his Thursday through Saturday scripts. Sunday’s look gets a much-needed jolt of personality with the funky Fashion Jacquard Polo. Lunar Control footwear in coordinating colorways will complete his look each day. Nick Watney has embraced color and bold patterns since his move to Nike and the brand’s Tour Performance Collection is a great fit for his aggressive play. 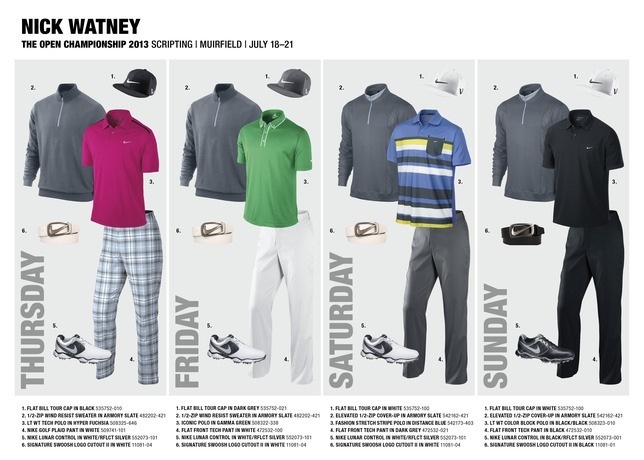 Watney will turn heads on Thursday as he tees it up in a bright fuchsia shirt and plaid pants. He’ll stick with the bright theme on Friday before finishing the tournament with an all-business black-on-black look on Sunday. Matching Lunar Control shoes and (the ever-controversial) flat bill hat will complete his outfits. 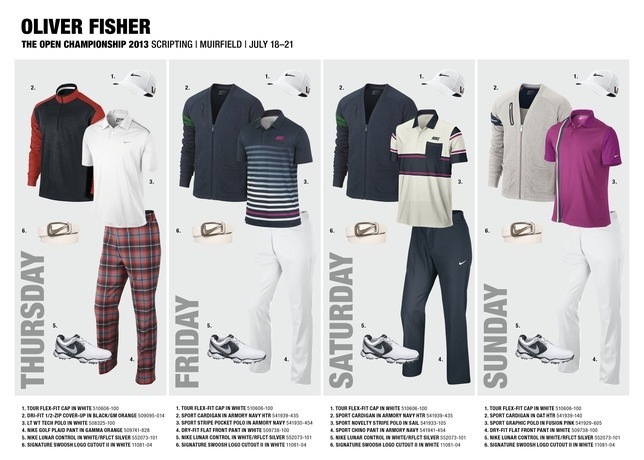 The young Dane will be sporting the most exciting and eclectic script of the Nike Golf athletes at Muirfield. 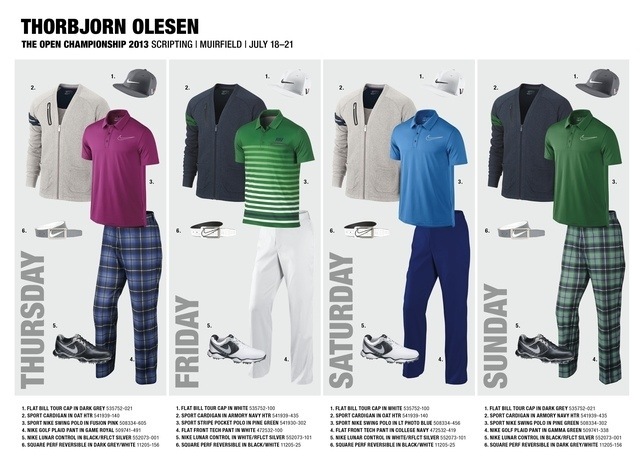 Olesen’s looks will span two collections (the Sport and Tour Performance Collections) and fuse a variety of bright colors, bold tartan plaids, vintage cardigans, slim cuts, sporty shoes and street-savvy flat bill hats for a youthful and edgy vibe.